The flowers are diurnal, scented, yellow, pink, orange or red, up to 4,5 cm long and in diameter. Origin and Habitat: Southern Bolivia (Chuquisaca, Potosí and Tarija), northern Argentina (Jujuy).This species is common in the northern subpopulation. Altitude: (3000-)3400-3800(4100) metres above sea level. Habitat and Ecology: The species grows in puna on rocky soils. The only threat is urbanization close to the southern subpopulation occurring in Argentina. Lobivia rossii var. stollenwerkiana (Boed.) Backeb. Lobivia rossii var. carminata Backeb. Lobivia rossii var. salmonea Backeb. 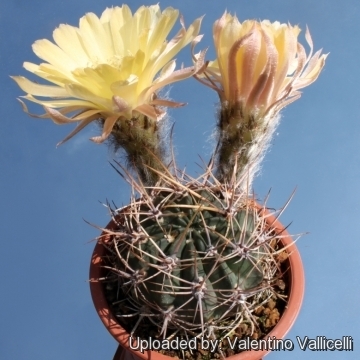 Lobivia rossii var. sanguinea Backeb. Description: Usually simple or rarely basally branched. This species reputedly grows almost completely hidden below the soil (in habitat), and is extremely hard to find unless it is in bloom. Three subspecies are recognized, the nominate form, subsp. haemantha (Rausch) M.Lowry and subsp. rossii (Boed.) G.Navarro. Stem: Globose, dull green, thick and growing mostly underground, but the stem of the plant in cultivation is usually globular or ovoidal and aerial. Dimension: 8-15 cm tall, 4-5 cm in diameter. Ribs: 16 to 17, straight or spiralled. Areoles: Oval filled, with grey wool in youth. 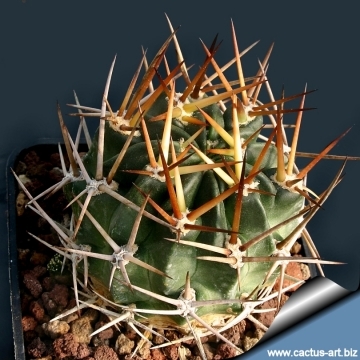 Radial spines: 4 to 7 (or more), flatly spreading, yellow to white with black tips, straight, subulate, dagger‑shaped, up to 3 cm (or more) long, though variable from plant to plant. Roots: Long, fat, tuberose taproot. 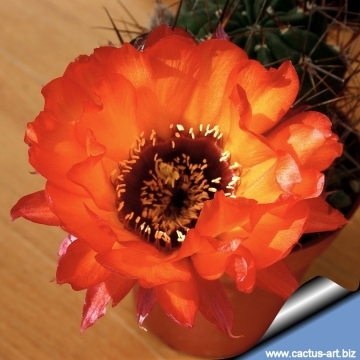 Flower: Diurnal, scented, funnelform, yellow, pink, orange or red, up to 4,5 cm long and in diameter. Fruits: Green, small, globose, semidry and dehiscent. 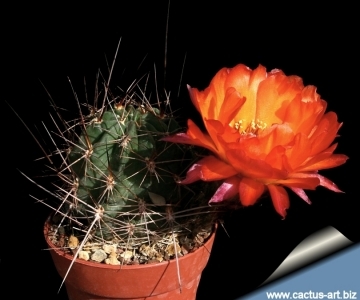 Echinopsis pugionacantha Rose & Boed. : (ssp. pugionacantha) has reddish-yellow flowers, 4,5 cm long. Distribution: Argentina and Bolivia. Echinopsis pugionacantha subs. rossii (Boed.) G.Navarro: has orange to red flowers: Distribution: Bolivia. 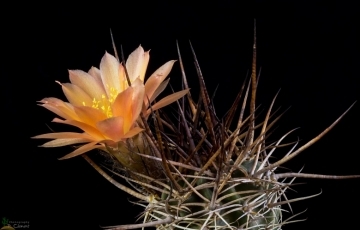 Lobivia pugionacantha var. culpinensis (F.Ritter) Rausch: has a globose mostly underground stem. Flowers yellow, pink, orange or red. Distribution: Chuquisaca and Potosi, Bolivia. Lobivia pugionacantha var. versicolor (Rausch) Rausch: varying spined with long and often very strong spines and only yellow flowers. Distribution: Potosi-Khuchu Ingenio, Bolivia. 1) Lowry, M. & Demaio, P. 2013. 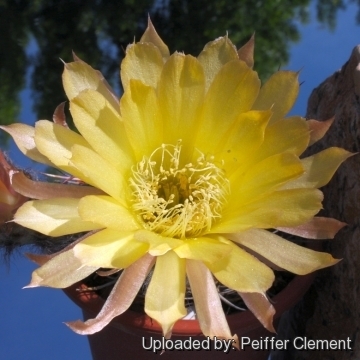 Echinopsis pugionacantha. The IUCN Red List of Threatened Species. Version 2015.1. <www.iucnredlist.org>. Downloaded on 19 June 2015. Cultivation and Propagation: is a summer-growing species that offers no cultivation difficulties. Water regularly in summer (but do not over-water). It is rot prone, and should be planted in a shallow pot. 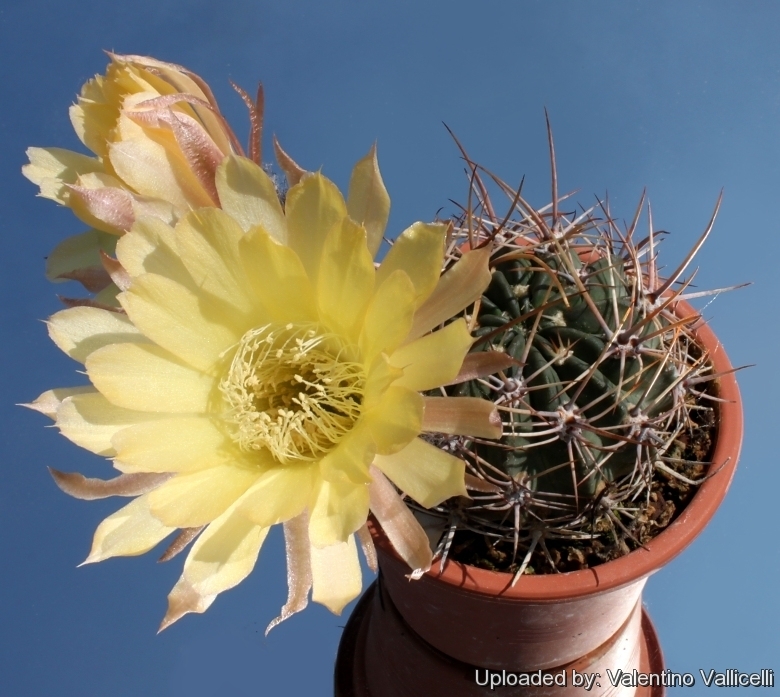 Like most Echinopsis cultivated for their blossoms, it needs a soil mixture that's a little richer than for the average cactus, still with excellent drainage. Keep rather dry in winter. 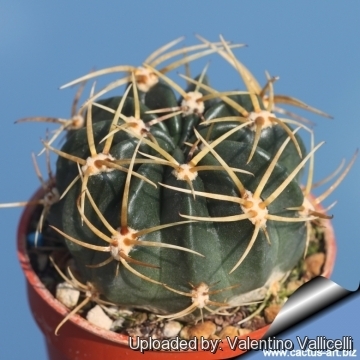 It is quite frost resistant if kept dry (hardy to -5°(-18°) C Outside full sun or afternoon shade, inside it needs bright light, and some direct sun. Propagation: Sow directly after last frost, offsets (if available).